Christmas is coming to Salem, but so is an evil force that threatens all mankind. In this memorable collection led by New York Times bestselling author Heather Graham, four powerful Keepers must save their community as a strange, eternal night creeps over the town. Forced to choose between their time-honored responsibilities or the lovers their hearts desire, these four extraordinary women must risk their own happiness to save the holiday. But Christmas is a time for miracles, and as each Keeper’s greatest longing is met, the Season of Light returns. 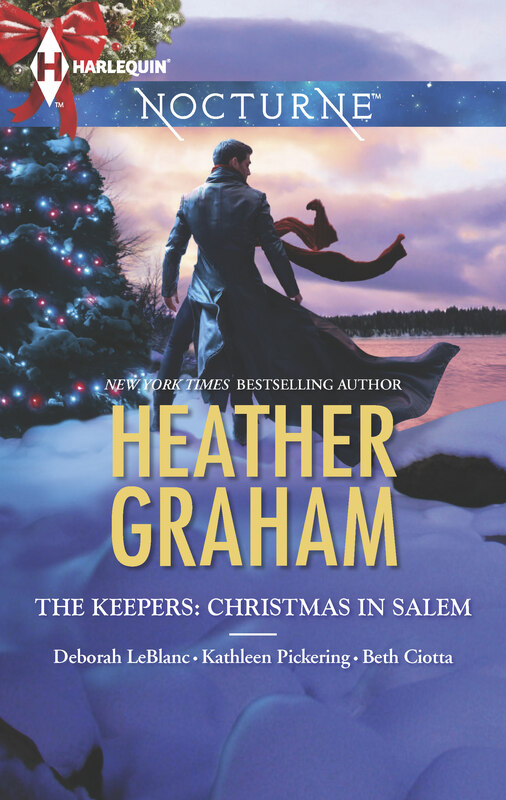 Don’t miss this magical holiday collection from Heather Graham, Deborah LeBlanc, Kathleen Pickering and Beth Ciotta. Typically Juniper Twist would be sound asleep. Typically most everyone in Salem would be asleep. Except for the parents who were wrapping last-minute presents. Or the children peeking out of their windows in hopes of spying Santa and his reindeer. Instead, in these moonlit hours before the dawn—at least as measured by the clock—of Christmas Day, the citizens of Salem, human and Other, were restless. Sleep patterns had been disrupted. A sinister darkness had crept into their lives, and over the last few weeks, as the daylight hours shrank to mere minutes and then disappeared altogether, an anxious desperation had seeped into their spirits. Would there even be a dawn? Ever? June pushed aside the magical tome she’d been studying for the past hour and stood to stretch her tense muscles. Snatching her fourth can of Red Bull, she breezed by shelves crammed with sacred texts and literature to get to the frosty pane of the Twists & Tales, the bookshop she’d recently inherited from her poor deceased uncle. Sipping the energy-charged drink, she peered into the black night. It had been just as black at two o’clock in the afternoon on Christmas Eve. On what had been a festive, sunny day everywhere else in the country, Salem hadn’t gotten even a half hour of blessed light. Scientists and meteorologists had pondered the phenomenon. The media had speculated like crazy. But none of them had suspected the truth, because, due to the code of silence, very few human beings knew of the existence of the plethora of supernatural beings occupying this planet. Vampires, selkies, shapeshifters, werewolves and fae, to name only a few. The Others had been living among humans for centuries, overseen by the Keepers, who helped them to peacefully exist in a world that had no clue as to their existence. June was a newly appointed Keeper. The Keeper of the Magicals, witches in common parlance. Witches with supernatural zing. Once upon a time, her father had been Keeper of the Magicals, but then he’d died and his younger brother, her uncle, had taken up the post. She had been marked for the future and had spent most of her young life looking forward to holding this distinguished position. Then she’d fallen prey to a spell. A love spell. Learning she’d been duped by those she’d respected and admired had altered her perception of witches. Oh, she still admired their magical powers and their affinity with the earth, but she didn’t trust them. She’d spent the last few years overseas, studying vigorously and learning as much as she could about witches—the magical kind, not the religious kind—although she’d boned up on Wiccans, too. She’d planned on being fully prepared, knowing all their tricks and how to better detect deception, by the time she became a Keeper. She would become impervious to bewitchment. Yes, she had centuries’ worth of knowledge to absorb, but she honestly hadn’t expected to fill a Keeper’s shoes for another twenty years. At forty-one her Uncle Artemis had been in his prime—as a man and as a Keeper. She still couldn’t believe he’d died of a heart attack. A heart attack! Considering the potentially dangerous and powerful individuals he dealt with on a daily basis, it seemed such a mundane way to go. Hence, June had been contacted by her family as well as the council. She’d abandoned her ancient studies near Stonehenge and flown across the Atlantic to take up her inherited duty. There’d been little time to mourn Artemis’s death, because she had landed smack-dab in the middle of this blackout crisis. It had been coming on ever since before the Winter Solstice and had gotten worse by the day. According to pagan beliefs, Yule was when the darker half of the year relinquished precedence to the lighter half. The days should have been getting longer, not shorter. It was as if their midwinter celebration had backfired. She’d even heard rumors that practicing witches and Wiccans were having a hard time keeping their Yule logs lit. At first she prayed heart and soul that this pall was a freak glitch in nature. And then she’d hoped some terrifying government experiment had gone awry. When it became apparent the darkness was Otherworldly, she’d willed it to be the mischievous doing of an elf or a sick prank by a rabid vampire. She wanted it to be any other Keeper’s problem but hers. Several of her cousins were Keepers. Katie Sue was Keeper of the Selkies. Roe was Keeper of the Elementals. Samantha was Keeper of the Vampires. Any one of them had more practical experience in these matters than June. All had keener leadership skills. All had more sway with their charges. Especially Sam. Heck, Samantha Mycroft was not only respected by the vampire community, she was beloved by the entire town, not to mention she was the de facto leader of all the local Keepers. June herself…well, she was an outsider. Or at least that was how she felt. She’d been away for so long, she felt dismally out of touch. With her family, yes, but especially with the witch community. Now she was back, and it was up to her to save the day—literally. Due to three separate and very recent Other crises, there was no mistaking that the darkness sucking the joy out of everyone this holiday season had been brought on by witchcraft. A harmful spell cast by a magical witch. Who was capable of such treachery? She couldn’t imagine. Because she’d been away from Salem for almost eight years she didn’t yet have a keen lock on the dynamics of the local magical coven or the latest gossip within the Other community. She’d been in town for two weeks now. She’d touched base with a few of her charges, made her presence known throughout town, but she’d yet to call a formal meeting. Out of respect, she’d spoken briefly with the acting high priestess, if only to assure Esmeralda she was on the job. The one thing June hadn’t done, the thing she dreaded most, was speaking with Esmeralda’s grandson, Basel Collins, a powerful wizard and the next in line as high priest of the local coven. The bad boy who’d seduced her soul and stolen her heart. Except it hadn’t been real. June tossed her empty can in the trash bin, blaming her racing pulse on the energy drink, not the memory of Baz’s passion. His soul kisses and heated touch. His declaration of love. Her cheeks flamed. That had been eight years ago, and she still felt the fool. “Crap.” If she had to speak with Basel, she would prefer someplace public. She wasn’t ready to be alone with him, and her bookshop had been closed for hours. If she left now, maybe she could avoid him, call him later and name her own meeting place. It took all the self-control June could muster not to reply, bah humbug.